The governing body of Ontario's Law Society recently decided to change its name to drop the historical moniker "Upper Canada". The issue garnered significant media attention, see e.g., here, here and here. Personally I supported the move and anticipated an informed debate about the issue, which I watched by webcast on September 28, 2017. It turns out that the discussion was vigorous, but also punctuated by some disconcerting misinformation and rhetoric. This blog lists and critically comments on some of these points, raised at Convocation. Given the result, nothing turned on the false, misleading statements of fact and fallacies that I heard. But many of the statements do highlight some of the myths and conflicting narratives that exist about lawyers and the role of law societies in Canada, which I've been thinking about for the last few years. My shot from a visit to Osgoode Hall a few weeks ago, at the East Entrance. 1. The Law Society of Upper Canada predated all other lawyer regulatory bodies (in the Commonwealth). 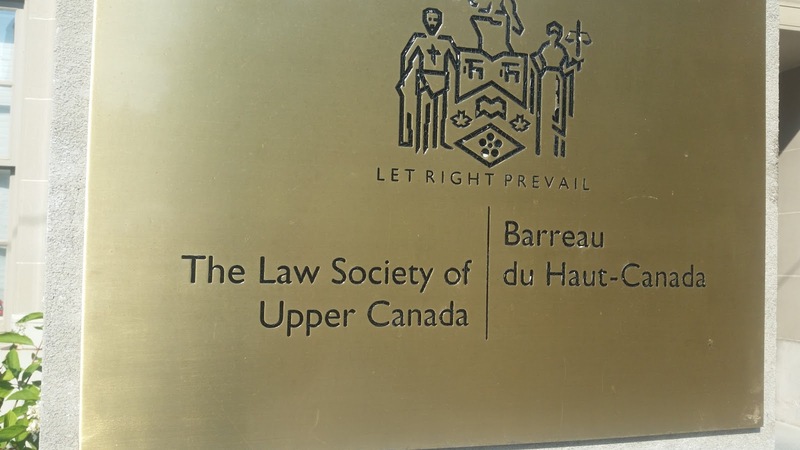 False: The Law Society of Upper Canada established in 1797, see here, was one of the first lawyer professional bodies in the world (& well before the creation of the British Commonwealth). By contrast, the traditional English Inns of the Court have existed for centuries, though they were never authorized by statute, and have always been exclusive bodies for barristers only. However, the Law Society, in what has been called Ontario since 1867, was not the first statutorily authorized professional body for lawyers in the British tradition. 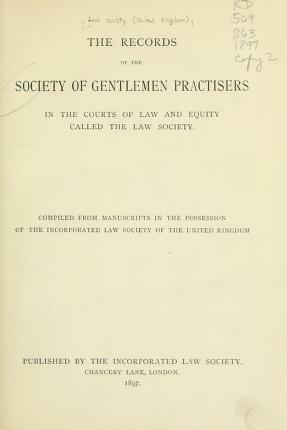 In England this claim is probably best made by the 'Society of Gentlemen Practisers in the Courts of Law and Equity '. 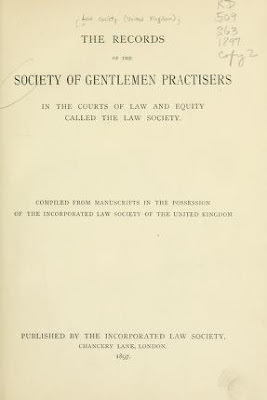 As Philip Girard suggests in his excellent article,** this body was given statutory authority in the 1730's for regulating the solicitors branch of the profession, then went through several iterations to later become known as the Law Society in the 1900's, which still exists today, see here. including this image in the public domain. Misleading: 'Membership' is the historic phrase predominantly employed to describe legal advocates subject to Law Society regulation. To the chagrin of at least some of my colleagues in law, that wording fell into some disuse several years ago. I suspect the shift in terminology had something to do with the possibility that the term 'membership' might be taken by some to imply a 'private club' kind of mentality, not in keeping with the modern public purposes of legal services regulation. Though still used, the Law Society more generally now employs the term 'licensees' to describe those it regulates, see the definition in the professional Rules. Current 'licensees' in Ontario are arguably members of a broader legal professional group, which has been expanded in Ontario to include lawyers, all barristers and solicitors (and historically attorneys in ON), as well as paralegals, but elsewhere includes notaries (BC and Que). In some jurisdictions it has even been expanded to incorporate recognition of a wide body of additional legal service providers (e.g. England & Wales), see here. 3. The obligation to consult the 'membership'. Misleading: The views of Law Society licensees (see above) are likely an important consideration in any prospective policy change to legal regulation in the province. However, any such consultation should likely not be considered determinative, since the statutory obligation of Benchers is to act in the 'public interest', especially since the explicit incorporation of this objective in the Law Society Act in Ontario in 2006, see s.4.2 (3). On this point, some confusion about the general scope of obligations of law societies may arise from recent and arguably inconsistent jurisprudential characterizations of legal regulators, a point discussed in more detail in my recent paper, see here. Briefly though, one case suggested law societies have an "unqualified" role to manage the profession (see para 108), another that Courts have a complementary authority over lawyer discipline, yet another that Benchers act as elected officials analogous to municipal councillors (see para 21). As I've described in another previous blog, I think this is all part of the evolution of the principle of independence of the Bar in Canada, which has been dynamic, so some ambiguity on this point may be understandable given the ongoing changes. In any event, I admit to finding parts of this argument disingenuously exasperating. For example, some asserted the proposed change was both unnecessary and unsubstantial. This is possibly a fair point, that I discuss in further detail below (under 6). However, it seemed unnecessarily clever and a little contradictory for some opposed to then later alternately suggest a name change was so consequential that it necessitated further, see here, consultation. 4. The legal regulator is 'independent' of government. Misleading: It really depends on what one means by 'independent'. I argued in my recent PhD the rule of law likely requires independence of the Bar. Just as it is for the judiciary, see my recent IRRP comment, lawyer independence in Canada is also conditional and subject to various qualifications. Most importantly the institutional independence of lawyers is qualified by the fact that all legal regulators in this country derive legal authority from provincial and territorial statutes (unlike their putative models, the English Inns of the Court). In a small bit of irony, there was also a contradictory argument posited by some opposed to the motion that, despite its ostensible independence, the Law Society did not actually have power to change its name, since it required provincial government approval to do so. 5. The Bar has led the emergence of Canada as a 'progressive' state. Misleading: This proposition significantly understates the involvement of lawyers, individually and as a group, in events and activities that have sometimes been regressive, illiberal and elitist. Lawyers play an important democratic role, in Canada and elsewhere, see my comment on this in the recent American context here. A more balanced view though acknowledges the connection between what can be called the 'lawyers & liberalism' hypothesis in this country is more tenuous. I talked about some examples of this lawyer (mis) behaviour, in the context of lawyer involvement in Canadian political scandals, in this previous post. 6. Changing the name won't solve the 'big' problems in legal services regulation. Fallacy: The problem with this proposition is that no one in favour of the motion actually appeared to make it. This is sometimes referred to as a 'straw man' argument, where a false premise is raised in opposition and then forcefully argued down. To be fair, I don't think anyone for or against the motion considered it particularly revolutionary. My understanding is that most who argued in favour thought changing the name, in particular to delete reference to the territory called "Upper Canada" until 1841, was instead a symbolic change signalling the legal regulator's forward looking commitment to diversity and inclusion. 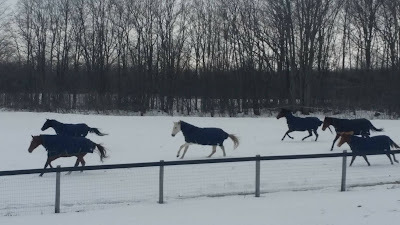 Our horses escaping for a run in the field last winter. Variations on this fallacy were that the legal regulator should not waste time with trivialities like a name change (also noted above under 3). Colloquially, this seems reminiscent of the expression about closing the barn door only after the horses have escaped. To be clear, this is the third time since 1993 this issue has been raised for consideration before the governing body of the profession in the province, as noted in news reports linked above. On this occasion, by the time Convocation met, resources has already been spent on consultations to study this issue last spring, see here. 7. Other archaic names aren't troubling, so why should anyone object to "Upper Canada". Fallacy: False analogy bolstered by argument ad populum. This involves deflecting debate on to a superficially related issue, other uses of historical names. In this case keeping the old name was also justified by the largely anecdotal assertion that preservation of the status quo is either popularly supported, or was of little concern to most. First, it's worth noting it's that there is some evidence that other archaic names, terms and phrases do, in fact, bother people, see here. As a specific example, maybe few are confused about the fact that 'British Columbia' is not British or in Columbia. But there are definitely some who think the name of the Canadian province is a misnomer that should be altered, see here and here. However, the principal point is that considerations of other historic names are well beyond the authority of Ontario's Law Society. The regulator had some scope though to address the specific and narrow question it did face. That is, to what extent was changing the name of the Law Society justified within its statutory mandate to act now in the 'public interest'? As I noted at the start, I supported the 2017 motion. I should also say that for a long time previously, I shared the views of those opposed to a name change. I was in attendance at the 2012 AGM, for example, and voted to keep the old name for many of the reasons set out well by Ian Holloway, here. However, in the intervening years my thoughts about this issue shifted. 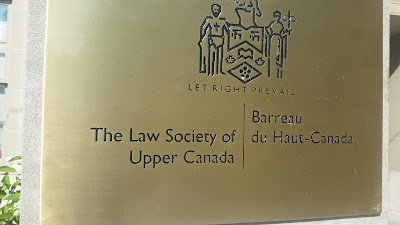 I now believe there is a better argument that the 'Law Society of Upper Canada' is inaccurate, outdated, and not in keeping with the modern purposes of the legal regulator. In the end, the Benchers voted 38 to 11 to abandon "Upper Canada", with the final form of its name to be determined later in the Fall. On one point at least I still agree with some of those opposed to the name change. Whereas Shakespeare's newly named flower might have smelled the same, the ultimate goal of Ontario's legal regulator is to improve on the original. Ultimately, it's time to turn from symbolic change, to meaningfully enhance access to justice and legal services for all Ontarians. In my opinion, this small name change might help. ** See Phillip Girard, “The independence of the Bar in Historical Perspective” in In the Public Interest, The Report and Research Papers of the Law Society of Upper Canada’s Task Force on Rule of Law and Independence of the Bar, (Toronto: Irwin Law Inc, 2007).